Assuming others' good intent increases trust and effectiveness. 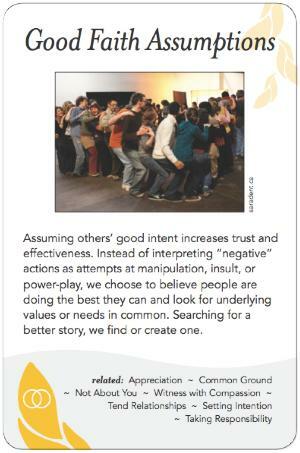 Instead of interpreting "negative" actions as attempts at manipulation, insult, or power-play, we choose to believe people are doing the best they can and look for underlying values or needs in common. Searching for a better story, we find or create one. This is closely related to "unconditional positive regard". Cautions & Caveats: If taken too far, this pattern could prevent an appropriate response to bad behaviour. Be ready to set appropriate boundaries as needed.